One of Masaccio's most important works, Trinity, depicts Christ being crucified with the Virgin and Saint John contemplating his crucifixion. In this tempera he develops a highly sophisticated model to depict perception which will become later known as linear perspective. The quote above the tomb reads, IO FU[I] G[I]A QUEL CHE VOI S[I]ETE E QUEL CH['] I[O] SONO VO[I] A[N]C[OR] SARETE , meaning, I once was what you are and what I am you also will be. 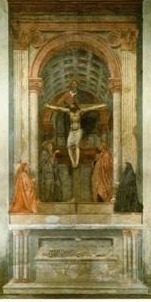 The vanishing-point here shown in red at the top of the bottom stare was key in Masaccio's development of the vault over head. The use of a lower vanishing-point gives the viewer a daunting notion of the power of God and the journey to salvation. This life size painting was probably commissioned by the Lenzi family and the two kneeling figures are probably two members of that family. The theme of the Trinity is probably one of the most famous themes of all time. It has been argued that due the location, inside a tomb, and that is was covered up buy a painting from Varasi and had a tomb placed in front it of it that this painting would not have been viewed by many people. The number of spectators was probably slimmer to that at the Brancacci Chapel, but keeping in mind that before the early 1400s, tombs or mausoleums were forbidden in Florence. When Masaccio painted this fresco, tombs had been recently permitted again and were of fashion. This painting was no doubt in part meant for public viewing. Although the theme of the Trinity being well known, there a few additional interpretations we can make from Masaccio's rendering of the scene. The painting is based in tradition of the Christian age; God the Father is supporting his crucified son, accompanied by the white dove (a symbol of the Holy Spirit) to complete the Trinity. Two underlying themes are present in this painting: firstly, a portrayal of the natural world inside the paining. The objects in the painting, such as the tomb and the spatially correct depiction of light and objects bind this world and the religious world. The image of God holding up Jesus draped in both colors closes the gap between the seen and the unseen, religion and the natural world. The painting also depicts the journey the body or soul must take to reach salvation. Unlike Christ's body which is still intact, our bodies decay and is represented by the skeleton under the altar. The use of realistic images of God and Jesus works well to promote this theme, as in the picture God and Christ are depicted as humans in the flesh. The skeleton, the human body, is placed at the bottom of the painting and must rise through the prayers and Virgin and John the Evangelist to the Trinity to achieve everlasting life, because only through prayer and devotion can we ever reach salvation. It is also possible that it represents the traditional medieval double chapel of Golgotha, where Jesus was supposedly crucified. The tomb placed at the bottom being Adam's and the Crucifixion in the upper part. Adam represents all men as he sinned and therefore all of have sinned by original sin. This could be seen as to give a lesson to all the viewers. We mortals will die but only through the Trinity can we achieve an afterlife. 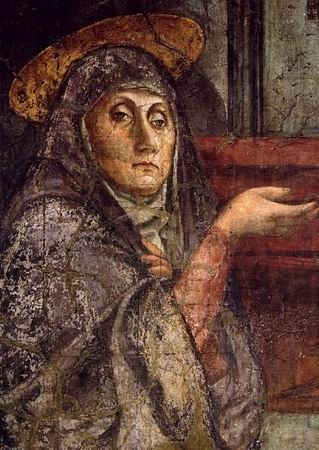 It is interesting to note Masaccio's portrayal of the theme. Mary is visible to everyone and invites us in to observe the crucifixion; Saint John however is lost in contemplation. 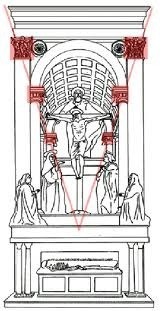 There is a vertical axis that directs the eye to move up and down and we find ourselves at the bottom able to rise high enough as the worshipers at the sides of the crucifixion. This painting's highly traditional theme of the Trinity is done in untraditional way. Much of the art work and the image of God we have today have been brought to us through the Renaissance and while the image does not seem out of place or revolutionary to us, to the Florentine at the time it surely was.